Tired of pumpkin everything? Take a break from the stereotypical fall desserts with these delicious Salted Caramel and Chocolate Chip Cookies! If you’ve made your way here from Grace in My Space, then welcome! I’m so excited to have you here today and we share some delicious fall recipes! Doesn’t Sarah’s Pear Pie look so yummy? When you’re done here be sure to head over to The First Year Blog to see Beth’s amazing Halloween Vampire Treats! I may have already done it with pumpkin spice everything this fall. Or at least, I just needed a break from it this past week. I had a craving for something sweet and salty in cookie form and after making a batch of these, they tick those boxes off perfectly. I actually took my mother in law’s much loved chocolate chip cookie recipe (it’s a family favorite!) and modified it by adding slightly more brown sugar, crushed hard caramels and some coarse salt. My husband said these are the best cookies he’s ever had. And considering how much he loves his mother’s cookies, that’s really saying something! If you’ve ever been to the UK or Ireland and had a Daim bar, these cookies remind me of those. If you’ve never had one, they are a thin candy with crunchy caramel inside and coated with chocolate. 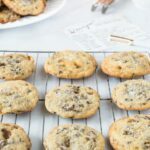 The crunchy bites of caramel in these cookies combined with the chocolate chips really gives a similar taste and brings me back to my childhood! Looking For More Easy Fall Baking? Last but not least, I want to mention this pretty recipe cards that you can see in the photos. I’ve partnered with the incredibly talented Olivia from Lovely Olive Living you bring you FREE recipe cards to download! From custom digital invites to commissioned art pieces and event signage for weddings, bridal showers and more, Olivia from Lovely Olive Living can help create one of a kind and beautiful art pieces and hand lettered items for anything your heart desires! You can follow her on Instagram here and on all other social @lovelyoliveliving. The perfect sweet & salty cookie. The crispy yet chewy cookie dough is loaded with chocolate chips and crunchy caramel and then sprinkled with sea salt. Place hard caramels in a zip loc bag. Place a dish towel over the bag. Bash with a rolling pin until you're left with chocolate chip sized pieces. Using a stand mixer with the paddle attachment, cream the softened butter and sugars. Add the eggs, then mix in all the remaining ingredients, except for chocolate chips and caramel pieces. Mix until well blended. Stir in chocolate chips and caramel pieces. Using a cookie scoop, drop individual scoops of cookie dough onto a parchment lined cookie sheet until you have about 8 or 9 cookies on the sheet. Tis the season for salted caramel everything! Jenna! These sound SO good!! Caramel is a favorite at our house, so we definitely need to try this recipe! These look amazing Jenna! I can’t wait to try them. Salted caramel anything is my husband’s favorite.